Even on Google.je Google struggles to differentiate between New Jersey, US and Jersey, CI. 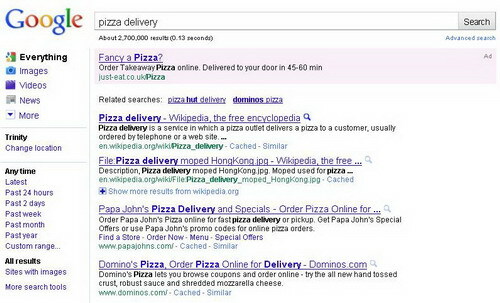 As you can see in the screenshot below Google thinks that Papa John’s or Domino’s are available in Jersey, Channel Islands. Island’s local restaurants such as Pizza Quarter or La cantina don’t even appear on page 1. There are things these businesses could do to improve their visibility on Google to ensure search engine users could find them. But, let’s just concentrate on user experience for a while and see what searchers could do to find local results on Google. 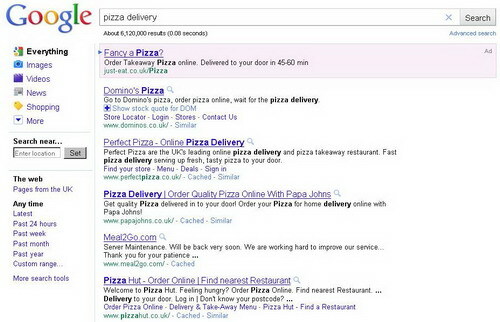 Similar situation when searching ‘pizza delivery’ on Google.co.uk, Google returns lots of irrelevant results. Let’s see what happens if we add Jersey and search google.je. The number one result is correct, but position number two is occupied by a New Jersey restaurant. This issue isn’t only related to local restaurants, similar problems occur when searching for hotels, jobs, real estate agents, plumbers etc. Although you can’t change or improve Google’s algorithm to make the search results more relevant you can refine your search queries to filter out irrelevant results. Here’re 6 simple tricks I’ve been using since I arrived in Jersey and they will definitely make your search results more accurate. 1) Add -NJ to your search query, Americans often add New Jersey acronym to the address, -NJ will get rid of everything with NJ. 2) Add -city, quite a lot of results return businesses based in Jersey City. 3) Add -new this is another negative search term, will effectively remove everything including -new i.e. New Jersey etc. Of course keep in mind that if you are looking for a new car you shouldn’t use -new as a negative keyword. 4) Include Jersey – adding the location name is always a good idea when searching for a local business. 5) Include St Helier or another parish if you know where the business is based. 6) And finally for local results avoid using Google.com always start from Google.je or Google.co.uk they are more likely to return local results. Any other tips? If you have any other clever ways of refining search results on Google please let me know and we’ll add it to the list. How’s it going? Nice post. I always include “01534” in my search to help refine it as most jersey businesses have a local tel no on their website. Great tips Luke. With Google slowly integrating social network information into their search algorythm hopefully results closer to home will become more prevalent in time.